the run known, as "Morgan's Magic"
ON THIS DATE (July 15, 1988) ... The Red Sox won under new manager, Joe Morgan, not once but twice. Roger Clemens rocketed his way to 16 strikeouts in a 3-1 victory in the opener. Rick Cerone and Wade Boggs hit homers to back a 7-4 triumph in the nightcap, giving the Sox a doubleheader sweep of the Kansas City Royals before a crowd of 35,412 at Fenway Park. In two games, Joe Morgan used every one of his bench players. In Game 2, he took care of any atrophy in the bullpen by using Dennis Lamp, Tom Bolton, Bob Stanley and Lee Smith in relief of Mike Smithson (4-3). In came Morgan, apparently bringing some fresh air with him. The move in which Morgan replaced the fired John McNamara Thursday may not have solved all the Sox' problems (they stranded 15 runners in the two games), but overall, they were hustling more and looking sharper, especially for a team that hadn't played since Sunday. Even baseball expert Jean Yawkey could be seen smiling from behind her glass wall. No one could have done more than Clemens in the opener. He fanned three in the first, two in the second and three in the third. By the sixth, Clemens was talking about maybe bowing out after one more inning. Instead, he notched his ninth complete game by retiring the last five Royals on strikeouts. Danny Tartabull, Frank White and Bo Jackson went down in a fanning finish. Moments after running his record to 13-5, lifting his strikeout total to a major league-leading 202 and lowering his earned run average to 2.35, Clemens dropped the game ball in Morgan's hand. In Game 2, Morgan had trouble on his doorstep right away. The Royals got a run in the first, but the Sox took a 2-1 lead in the bottom of the inning. 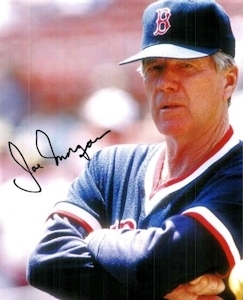 By the third, they had a 4-1 lead and Morgan didn't really have to begin managing until the sixth when the Sox had a 6-1 lead, on the strength of the homers by Boggs (solo shot in the second) and Cerone (two-runner in the fifth). Morgan faulted himself for going one batter too many (a Danny Tartabull two-run homer) with Smithson, allowing the Royals to close within 6-3. Along the way, Jim Rice (5 for 6 in the doubleheader) got back in the ballgame, too. Rice also broke up a double play that led to a key run in Game 1. The Sox averaged 11 hits per game, saw Smith come in for a nice save (No. 12) and even nudged a little closer to the Yankees and Tigers in the American League East. All of sudden, Lansdowne Street may not be a condemned area.